Thanks for this. Almost through with the first book of an epic fantasy trilogy, and, as it’s my first multibook story, I’m discovering what you just said–themes change over the course of the novels, and, holy crap!, I need to start some sort of compendium about my characters, the places, the magic… all of it. I love the idea that society is about more than the sum of its parts. That’s as true of individual members as it is of the whole community, and people tend to forget both entirely too often. Enjoyed Updraft, and just ordered Cloudbound. I’ll suggest to our YA librarian we pick up Horizon too. @clancyweeksblog – thank you and good luck! > I love the idea that society is about more than the sum of its parts. That’s as true of individual members as it is of the whole community, and people tend to forget both entirely too often. I think you’re right – it’s all a bit fractal – and it’s really important to remember that. >Enjoyed Updraft, and just ordered Cloudbound. 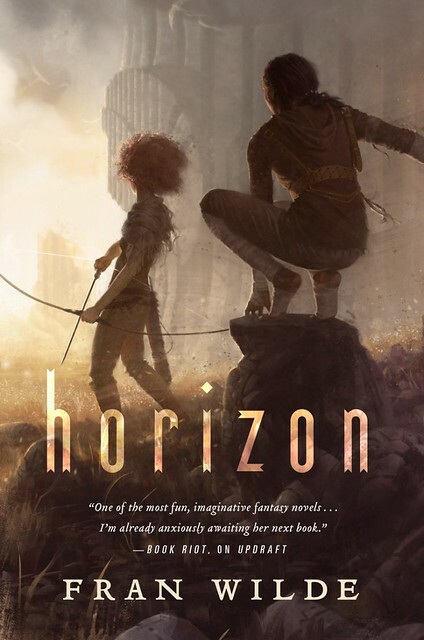 I’ll suggest to our YA librarian we pick up Horizon too. Thank you so much! Glad you are enjoying the series! I’ve written an entire trilogy (broadly YA Dieselpunk) simply to tell the whole story, not least to myself. I’m more planner than pantser and wrote copious notes etc. but still have to plug plot holes and keep my eyes on the woods as well as the trees. Meanwhile, my house is full of towers, not of bone but of books, but ‘The Bone Universe’ trilogy will be joining my main TBR pile soon, even if it knocks it over! > Meanwhile, my house is full of towers, not of bone but of books, but ‘The Bone Universe’ trilogy will be joining my main TBR pile soon, even if it knocks it over! Thank you so much! Best wishes for your trilogy! I knew the third book in the trilogy was coming, but didn’t know the release date. It’s now pre-ordered and I’ll be able to start reading it Tuesday morning. I’m really curious to see where you take the story after the revelations at the end of Cloudbound! @shbeaty – I’m so glad to hear this! All will be revealed! There will be some news on that front shortly in a couple different ways, hopefully very soon! Thanks, Fran, on both counts! It’s always interesting to learn about the process. I really enjoy that the blog here encourages discussion about books and ideas, and promotes other authors’ works, so fans can find more good stuff to read or watch or listen to. And lately, I greatly appreciate that the blog here is refreshingly civil and even-handed. It’s a lost art. @bluecatship – agreed. John & Whatever are both doing a lot of good.